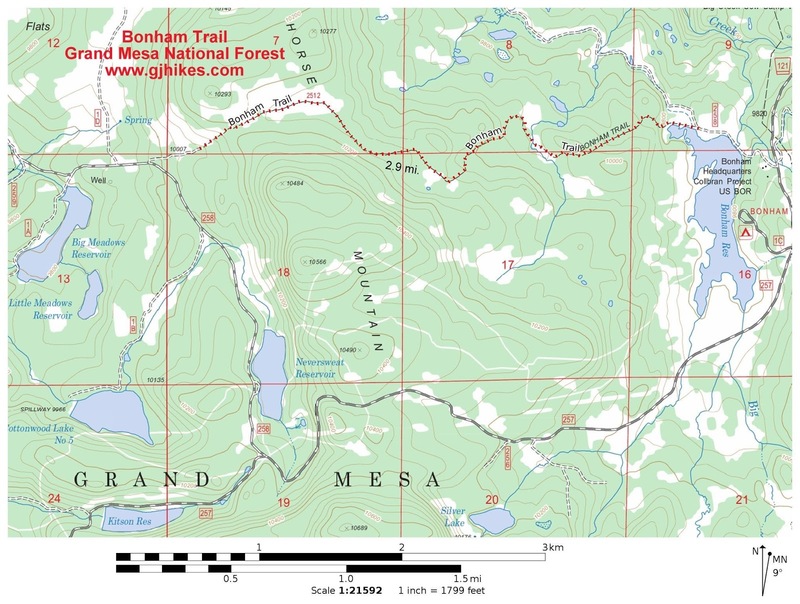 The Bonham trail is located in the Grand Mesa National Forest near Grand Junction, Colorado. 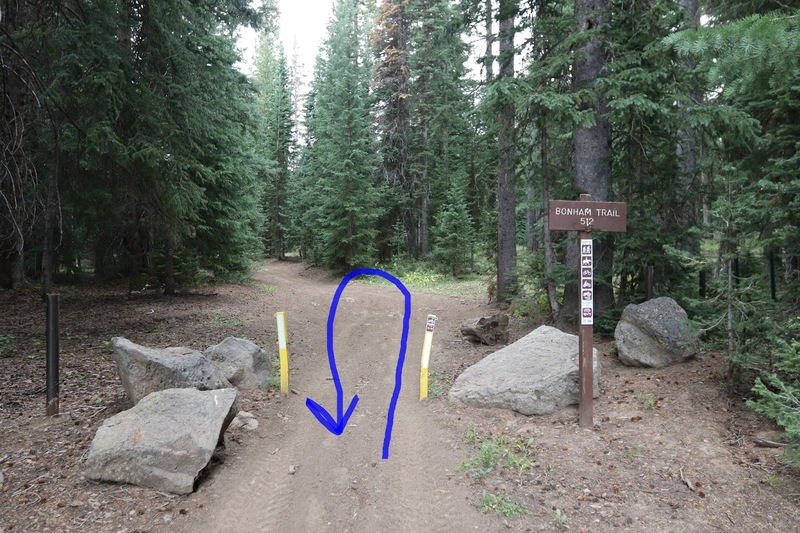 The trail begins at Bonham Reservoir where it follows an old jeep road through a forest of aspen and conifer trees for 2.9 miles until it reaches Forest Road #258.1C and comes to an end. The trail gets most of its use from ATV enthusiasts. The shortest route to the trailhead is by following Forest Road #121 from Collbran for 12 miles and turn right onto Forest Road #259. Follow the road around the northeast end of Bonham Reservoir and park near the dam. Across the dam the route passes through a trail squeeze that limits the width of ATVs to 50 inches or less. After passing through the trail squeeze the trail begins climbing up a rocky slope. The trails elevation profile greatly exaggerates the grade but it is useful nonetheless in depicting the overall trend. For most of the way the change in elevation is gradual enough not to require a lot of effort. Typical of forest trails Bonham winds its way peacefully through the stands of aspen, pine and spruce trees separated by grassy meadows of mountain wildflowers. Right around the 1 mile point the trail crosses Big Creek. At this point the creek doesn't seem to live up to its name but this is just a tributary branch of the main drainage. The trees do a good job muffling the sound of the occasional ATV that comes along. By the time the trail reaches the mile and a half point it is traveling through open meadows that are above 10,100 feet in elevation. The trail reaches its highest elevation at the 2.5 mile point where it begins a descent where it will lose over 120 feet of the elevation it has already gained. At the 2.9 mile point Bonham passes through another trail squeeze where it meets up with Forest Road #258.1C and comes to an end. A person could follow the road in either direction and loop back to Bonham Reservoir. Going to the right it is about 6 miles back via FR #259 and going to the left it should be just over 5 miles via FR #258 and #257. Be sure to take a map if you are unfamiliar with the area. We had several ATVs stop and ask us about the trail and all its connecting routes. 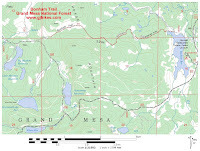 We were on foot the day that we took the photos for this post and as an out-and-back Bonham was a great trail for hiking. It rained for a few minutes which helped to really bring out the musky aroma of the forest that mixed well with the various wildflowers and sage. For those that would like to spend more than just the day Bonham Reservoir has a few primitive campsites and we have always managed to catch fish there. Add that to the milder temperatures than what you will find at lower elevations and you have everything that people love about the Grand Mesa. If you would like to see it for yourself then all you have to do is 'Take a hike'.